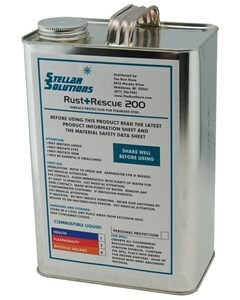 When you need an extra layer of rust prevention on stainless steel, we recommend Rust Rescue 200. In certain environments with salt or chlorine, or if the stainless is already corroded, stainless steel benefits from an extra layer of chemical protection provided by Rust Rescue 200. One gallon covers approximately 800 square feet. Although very safe in normal use, Rust Rescue 200 is a Calcium sulfonate based material, and as such it may cause irritation to exposed surfaces of the body for some persons. Rubber or plastic gloves should be worn when applying the product to a surface or when wiping it dry. A. Yes, stainless steel should always be passivated. We recommend using Citrisurf® line of stainless steel passivation chemicals.